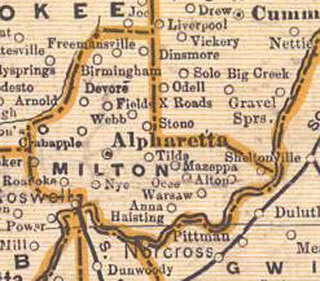 1899 Map of old Milton Co. showing communities of Mazeppa, Sheltonville, Ocee, Alton, and Warsaw within the current Johns Creek borders. The area that is the present day City of Johns Creek had many communities sprout up and disappear over the years. Below are some names of historic communities/settlements that appear on maps from the 1800s through the early 1900s. The Johns Creek area was also part of multiple counties over the years. Learn about local history with these books now available in the library's reference section - a great resource for any interested in tracing the geneology of a local family or discovering stories of the land, events, and earlier inhabitants of the Johns Creek area. These 4 markers were installed as a Leadership Johns Creek project in 2010.